±0.03 % setting ±3 dgt. Sink /source; ±12 V, ±0.03 % setting ±5 dgt. Pulse signal generation: 0.5 to 4800 Hz, 28 ranges, ±0.005 % setting ±0.01 Hz. Measurement functions and Basic accuracy DC Voltage: 50 mV to 250 V, 5 ranges, ±0.03 % rdg. ±5 dgt. AC Voltage: 50 mV to 250 V, 5 ranges, ±0.7 % rdg. ±20 dgt. AC+DC Voltage: 50 mV to 250 V, 5 ranges, ±0.8 % rdg. ±25 dgt. DC Current: 50 to 500 mA, 2 ranges, ±0.03 % rdg. ±5 dgt. AC Current: 50 to 500 mA, 2 ranges, ±0.6 % rdg. ±20 dgt. AC+DC Current: 50 to 500 mA, 2 ranges, ±0.7 % rdg. ±40 dgt. 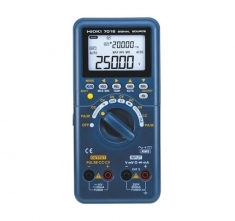 Measurement functions and Accuracy Resistance: 500 Ω to 50 MΩ, 6 ranges, ±0.15 % rdg. ±5 dgt. Frequency: 100 Hz to 200 kHz, 5 ranges, ±0.02 % rdg. ±3 dgt.